It’s January now, the festivities are all behind us and the days are getting longer (at least for us Northerners). We have a whole year ahead of us, full of possibilities, and very full of games! Yes, it’s the time of year everyone starts anticipating the coming year’s lineup, and the time of year bloggers and journalists start producing their ‘most anticipated games lists’. Many such lists have been produced over the past weeks, and one game seems to feature prominently among them. One that should come as no surprise to Zelda Dungeon readers. Link’s next big outing (and we use the word ‘big’ very deliberately here) is featuring very prominently in almost everyone’s list. 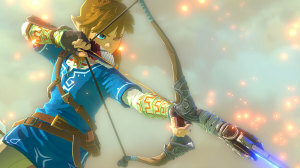 Associated Press entertainment writer Derrik J. Lang has added Zelda Wii U to his list, putting Link up along with the likes of Batman and Nathan Drake. Link won’t be the only hero getting ready to explore an open world, with other games like Metal Gear Solid 5 hitting the shelves this year. The only other Wii U game to make Derrik’s list was Star Fox, and that was shoved into the ‘others’ list at the end. If Derrik’s list is anything to go by, 2015 is surely going to be a fantastic year for gaming. How tall Zelda Wii U ends up standing among them remains to be seen, We can only hope the hype and the gorgeous screenshots don’t leave us all a bit deflated. What games are you looking forward to playing this year? Besides Zelda Wii U (which you’ll obviously be buying) what other games tickle your fancy?